When You See Surfers at Sunabe-Head South! This week we need to hit the road again and get some great diving in. Soon you will be loaded down with new dive gear and lots of new gadgets to try out. Since none of the pools are open to the public you are surely going to want to find a dive site with pool like conditions so you can check out that new BCD/Wetsuit/Fin combination that you are about to get for Christmas. So head south young man (and woman). My last visit to the Southern Tip of the Island was the same weekend that our island was host to the G-8 Summit. That seems like years ago doesn't it and yet it was only the last week of July. Now that we are at the other end of the seasons it seems like a good idea to once again head south! A week ago I packed up my camera gear, met with some friends and headed on down the highway. But this time I found out that a few things had changed a bit since my last visit to Channel Crevices so please note that these directions have been accurately revised. Why head south? Not only is Channel Crevices one of my favorite dives on the island it is also one of the few dive sites that is safe when winter winds have blown Sunabe, Maeda and Onna into a surfer's paradise. Even better, I find that Channel Crevices is also a great dive site for friends and families to meet and enjoy the safety of the lagoon while diver buddies wander through the channel and enjoy the excitement of wall diving while experiencing the drama of cruising through large boulders and the crevices up and down the coast line. At "Channel Crevices" divers will enjoy a free ride through the channel. Depending on the tidal movement you may either get a ride out to sea, or a gentle push back in through the reef line. Either way it sure is fun to "Shoot the Channel." However, you want to be sure and stay close to your buddy and keep an eye on your air gauges because you will use air much quicker if you are swimming against the force of the tidal movement. Keep your eyes open when traversing through the channel because there are always small zebra striped scorpion fish hanging out in the cracks and crevices snatching a meal from the current as the smaller fish swoop down though the edges of the channel. My friends and I had a wonderful day of diving on the southern tip of Okinawa while everyone else that remained up island was looking for a dive site. While they were driving we were basking in the sun and lazily practicing our photography in water flat as a bathtub. This is a great dive spot and I highly recommend you find your way south during the winter for the flat water. 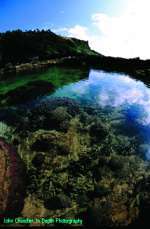 Site Location: This dive site is not far from Peace Park area on the Southern edge of Okinawa. If you are coming east toward Peace Park from Naha a turn off to the beach is about one kilometer before the Park entrance. If you are coming south from Gushikami go past the Peace Park entrance about one kilometer and move through the first intersection with a traffic light. Continue through this light, and toward Naha, about 100 meters. You will see a new highway sign that says "Odo Coast" and points toward the Ocean on your left. This is a permanent marker that hangs over the roadway and is very easy to find. Remember "Odo Coast" and use this as a landmark. From your left a road comes up to the highway in a "T". If coming from Peace Park turn left, or if coming from Naha turn right. After turning at this sign follow this hard surface road south for about 500 yards down into the cane fields until it comes to a "Y." Turn left on to a crushed coral road. You will be heading toward a large construction site on your left. You will wind past a concrete pump house on your right. Australian pine trees will be on your right and the road will continue around to the right and open up in to a beautiful beach with very nice shore side facilities. What to expect: Bathrooms, showers, and a nice pavilion that has been constructed for beach lovers. The beach is monstrous here. Sandy beach for at least 2,500 meters. A large lagoon that is great for snorkelers and Kayakers. Other activities: Kayaking and Snorkeling for everyone! This is really one of the best places to put in and just scoot around the lagoon and into the open water with your Kayak. Underwater Photography is very good when the sun is high overhead and can penetrate into the overhead lighting the caverns and caves. GREAT BEACH WALKING. Here you can walk for more than a mile (1.6KM) toward and into the Kyan Coastline. It is great. Aquatic animals found here: Large fish of every kind. Sea Turtles have been observed gliding across the coral mounds at 60'. Not many Sea Snakes here. Lobsters are usually seen peeking out of the ledges inside many of the caverns. Best time of year to dive: NOW. See you at the Crevices! and please remember to check out even more ideas for great diving on my website at www.jwchandler.com.